Opera does it again. Latest Opera 11 beta comes with a new impressive feature called Tab Stacking which is in many ways similar to Tab Candy in Firefox 4.0, but a lot more practical approach to the same problem. The latest Opera 11 beta was released a day ago and it is already getting rave reviews across the web. New tab management feature called Tab Stacking is impressive and we are probably going to see implementation of a similar feature in different browsers soon. 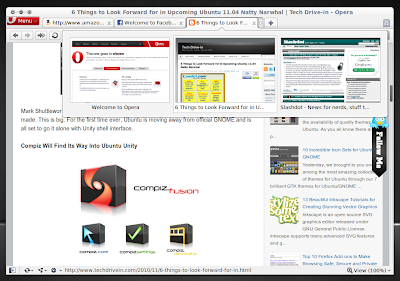 Firefox 4 beta already have tab management feature called Tab Candy. But Opera's new Tab Stacking functionality feels more integrated and idiot friendly. Opera 11 beta also brings in a new auto-update system which makes sure that your extensions and Opera Unite apps are always up to date with the latest enhancements. Detailed list of Opera 11 beta features. 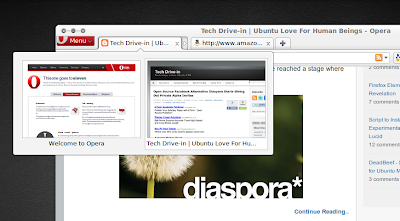 As usual, Opera packages are available for almost all popular Linux distributions as well as Mac and Windows based systems. In Ubuntu, simply double click on the .deb Opera package to install it. One thing is sure, browser wars are far from over. May be the fight for dominance has only intensified. And for the first time, IE is really feeling the heat. IE market share was below 50% for the first time in 11 years and things have never looked better for rivals that include Firefox, Google Chrome and Opera. Interesting times ahead.